A Knowledge Mobilization Lunch at UVic / Un déjeuner de la mobilisation des connaissances à UVic – Mobilize This! 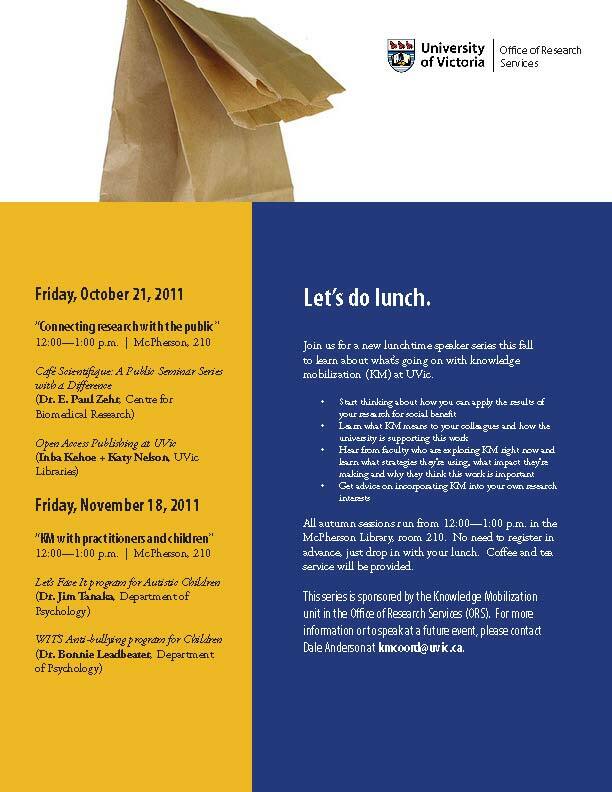 Knowledge mobilization and the public: That was the theme of the inaugural event in our KMb Lunch Series held on October 19 at UVic. La mobilisation des connaissances (MdC) et le public: tel était le thème de l’événement inaugural de notre série Déjeuner de la MdC à UVic du 19 octobre. Our kickoff speaker, Dr. E. Paul Zehr, shared his story of the very successful Café Scientifique he and colleagues from the Centre for Biomedical Research have established. The Café features talks (and he stressed they are talks, not PPT lectures) by university faculty on their research, held for a small group of up to 70 people at a local pub. Faculty talk, participants listen, beer and other beverages are consumed, and questions and discussion ensue. Paul believes sharing research with the public this way actually serves the interests of researchers, as it helps the public see the value of research dollars, and also helps them apply research findings to their own lives. The Café has been so successful, it has folks who sign up for all nine sessions, and has led to a spin-off Café organized by Physics and Astronomy. Katy Nelson and Inba Kehoe from the University Library were our second speakers. They told us about UVic’s open access publishing options, including UVic Space and UVic’s online journal hosting service. Getting research into the hands of those who don’t have access to peer-reviewed journals is becoming a requirement of many funding agencies, and is one of the first steps in the knowledge mobilization journey. UVic Space helps meet this need, and the library’s webpage lets you see how many people from across the world do access these documents: Russia, China, Switzerland … who knew? Sharing KMb knowledge and experience with colleagues was important, but equally important, the event gave participants an opportunity to make those connections we all realize are critical to KMb. While we gathered for just an hour, in that short hour we planted the seed for yet another Café Scientifique … and thus KMb grows, and researchers and the public all share the benefits. This entry was posted in Past Events, University of Victoria and tagged Cafe Scientifique, Uvic, Workshops. Bookmark the permalink.